Thu., Sept. 28, 2017, 8:20 a.m.
MADRID – Authorities in Catalonia aim to ensure that a disputed referendum on independence from Spain will take place peacefully on Sunday despite a crackdown on the vote by the national government, the region’s interior minister said. Minister Joaquin Forn said Thursday that Catalan officials are determined to proceed with Sunday’s vote for the region of 7.5 million people in northeastern Spain even though the central government in Madrid says the vote is illegal and can’t happen. “The (Catalan) government’s commitment is very clear: people will be able to vote,” Forn told reporters in Barcelona, the main city in Catalonia. Forn met with regional security officials to defuse mounting tensions ahead of the ballot. In recent weeks, Spain’s Constitutional Court has ordered the ballot to be suspended and police have confiscated ballot papers and posters for it. 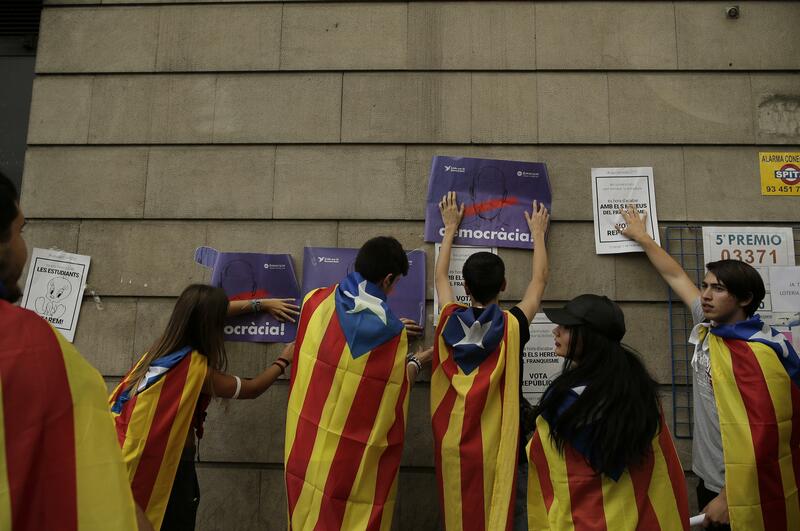 The central government is deploying 10,000 police officers in Catalonia for the ballot, Forn told reporters. He insisted, however, that the Catalan police force called the Mossos d’Esquadra must take their orders from local authorities. The force’s loyalty has been torn between the central and regional governments. Earlier Thursday, Catalonia’s foreign affairs chief Raul Romeva appealed for support from the European Union for the referendum. Catalan regional President Carles Puigdemont has accused the EU, in an interview with The Associated Press, of “turning its back” on Catalonia in its conflict with Spain’s central government. EU institutions need to “understand that (the referendum) is a big issue,” Romeva said in Brussels. Thousands of striking Catalan university students, many carrying pro-independence flags, marched in Barcelona to protest the central government crackdown on the ballot. The watchdog added that Spanish authorities’ legal measures against Catalan media to stop the spread of information about the referendum have contributed to an atmosphere of extreme tension. Published: Sept. 28, 2017, 8:20 a.m.